Roses and candy are Valentine's Day staples, but what about roses and vodka? 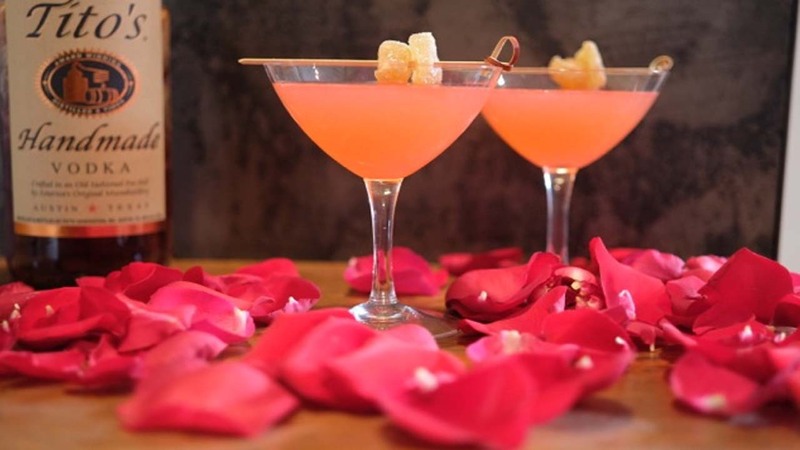 Here's a recipe for a perfect Valentine's Day drink, Tito's Everything Nice. Thoroughly wash about a cup of red rose petals in water. Add to a liter of Tito's Handmade Vodka. Allow to sit in a cool place, away from direct sunlight for 5-7 days, giving it a good shake every day or so. Strain the rose petals out of the bottle after 5-7 days, or when the mixture has reached the desired taste (and color). Peel a good sized chunk of fresh ginger, and slice into thin rounds. You should have about 1/2-3/4 cup. Add 1 cup of sugar, 1 cup of water, and fresh ginger slices to a pot. Bring to a boil. Reduce heat, and gently simmer, uncovered, for 30 minutes. Remove from heat, strain into a jar, and allow to cool completely. Add the rose petal Tito's Handmade Vodka infusion, the fresh lemon juice (double strained), and the ginger simple syrup to a cocktail shaker with ice. Shake well, and strain into a coupe glass. If you like, top with a splash of brut sparkling wine. Garnish with a piece of candied ginger or a lemon twist.